Books about cats are quite difficult to get right. Even for dyed-in-the-fur cat-lovers, plenty of the feline narratives out there are too fey. I have to confess to struggling with Paul Gallico’s Jennie, for example, although I loved The Fur Person by May Sarton. The key seems to be to avoid sentiment; to describe a cat’s behaviour accurately, and only interpret its possible thoughts and emotions with verisimilitude or (to be on the safe side) cynicism. 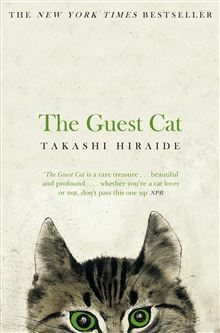 When I say that I want to avoid the fey in cat novels, you may be surprised when I describe the plot of Takashi Hiraide’s novella The Guest Cat (published in Japanese in 2001 and translated into English by Eric Selland in 2014). Because it does sound ridiculously cutesy: a couple in their thirties find that their lives and love is revitalised by the appearance of a neighbour’s cat. So you’ll have to take my word for it that it’s beautiful rather than cloying. Chibi isn’t overly affectionate – she doesn’t let the male narrator or his wife pick her up – but she becomes a constant in their lives; a focus that they can turn their attention to, in the absence of children. Chibi came and went three times a day, staying for around three hours each visit. After the neighbours (her official owners) went to sleep, she would slip through the boundary hedge, and come over to this little house where the lights were still brightly lit. Then she would show that she wanted to play, and a game of ball would begin in the dark garden. After a while she would tire of the game and in the predawn hours retire to the closet and sleep. She seemed to find pleasantly comfortable the combination of this twilight nook with its human smell and the softness of the cushions. The couple at work at their desks through the night would follow her lead and go to sleep, but then the small guest would again awaken by 7:40 a.m. at the latest and eat the food which had been prepared for her in the cupboard box and drink up the milk in the saucer placed beside it, and quickly leave. Unsurprisingly, it is Hiraide’s writing that makes The Guest Cat the mini masterpiece that it undoubtedly is. You get the feeling that he could have turned his pen to any topic under the sun and achieved something equally poignant. Each sentence is weighed beautifully (for which thanks, presumably, also goes to the translator) – and without ever feeling over-wrought or detached, his style is moving and measured. It is apparently largely autobiographical, which must have helped; Hiraide is a master of observation. The affection the narrator clearly feels for his wife is somehow communicated entirely by the way he observes her actions and repeats her words; the cat is the catalyst for describing a marriage. I suppose it is intimacy that he so expertly conveys. I thought I was going out on a limb when I picked up this book; apparently it was a huge seller last year, and so you may already have read it, or at least heard of it. For those who hadn’t, this novella deserves all those accolades that are often given willy-nilly to novellas – it is a gem, a treasure, and a rarity. I received this book as a gift at Christmas and I hated it. Yes, it is beautifully written but I was so angry on behalf of the little boy whose cat it was. This man and his wife ‘stole’ the little boy’s pet by enticing it into their house with food and bedding. It was wrong, wrong,wrong and left me with an intense dislike of the author. do cats make people feel they are special because a cat chooses to accept their food bribery? discuss …. I can’t say I want to read this book as I don’t specially care for cats. I don’t dislike them, but having experienced them living off me in earlier parts of my life, i wouldn’t bother with one again. Simon’s persuasion is very effective though: I am quite prepared to give Hiraide a try for his prose qualities, but not this book. I enjoyed this quiet book. I am also a cat person. There were times I didn’t like the narrator or his wife but the cat made up for the character flaws. It was clear to me that the author knew of cats as the cat behavior is beautifully described. This entry was posted on March 4, 2015 by Simon T in Entries by Simon, Fiction in translation, Fiction: 21st Century and tagged cats, Japanese fiction, Japanese literature, Takashi Hiraide.